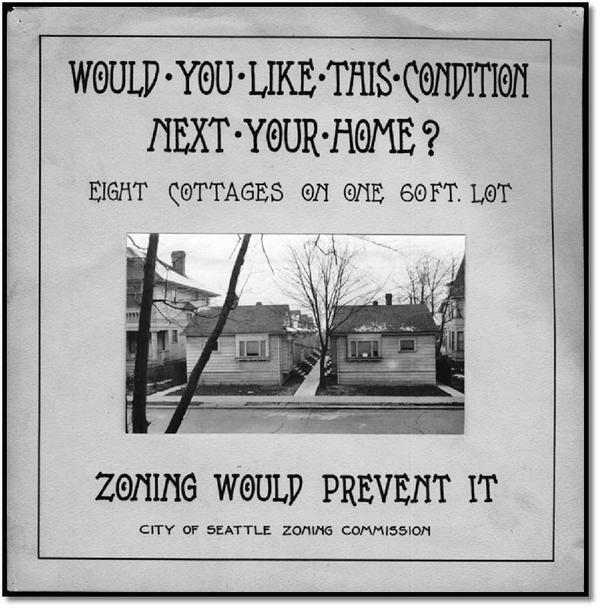 I'd wanted to write a few words about the recent controversy over single-family zoning Seattle, but that debate has been addressed so well and thoroughly by other writers that I'm not going to rehash the details. Apart from the local politics of that debate, one thing that it has accomplished is to assist in highlighting exactly what single-family zoning means in an American context. Although it sounds self-explanatory, the term "single-family home" has a distinct perception and legal meaning that goes well beyond the mere physical form of a dwelling. Through a series of court cases, including the Euclid v. Ambler decision, American courts have gradually allowed the enshrinement of this perception into law with hardly so much as a dissenting opinion. 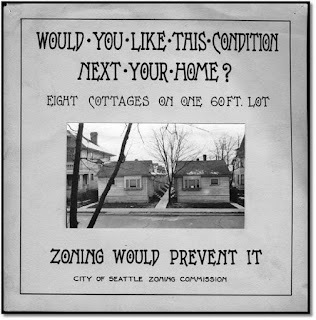 Many of those debating single-family zoning in Seattle (and in other cities) take these various legal incidents for granted as an integral part of an area devoted to standalone houses, although they are conceptually and legally separable. The American Conception of the "Single-Family Home"
The typical American single-family home, and the zone within which it lies, are defined by (at least) five key legal elements which I've laid out below. I call this conception "American" in line with Sonia Hirt's analysis in her recent book, Zoned in the USA, where she discusses how the single-family zone, as defined below, is a century-old American invention, and is rarely found in the land use codes and regulations in other countries. 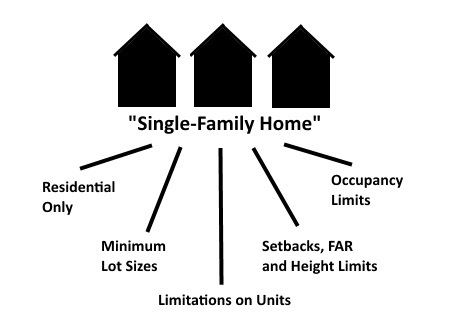 Although the the debate generally focuses on the third of these (limitations on units), and sometimes the fourth, each of these supporting elements are essential to sustaining the American ideal of the single-family zone. Remove any of them and the concept breaks down. That allowing some non-residential uses would transform single-family areas seems too obvious to mention, although the consequences of doing so are often greatly exaggerated. Many residential streets are simply not economically viable sites for commercial activity, and certainly not those which depend on a high volume of customers. An abolition of minimum lot sizes, in fact, might be even more transformative. On the typical housing lot of 6,000 square feet bordering street and alley, three or more detached homes might be built. On Twitter, Mike Eliason provided a photo of how this very result was feared by the incumbent homeowners of the 1920s (at right). These were single-family detached homes, to be sure, but they violated the perception of what a proper single-family home should be (aside from stirring up various other anxieties and prejudices). Setbacks and FAR limitations predated limitations on units, and in conjunction with minimum lot sizes were used to achieve the same result, as well as to enforce aesthetic preferences (specifically, for large front lawns). With their intention of making impractical and uneconomical all but detached, one-family houses, they incidentally also forbid other types of single-family housing, including the ancient typologies of courtyard homes and rowhouses. Limitations on units are the the essence of the single-family designation, and lend the category its name. This limitation often tests the bounds of rationality and common sense: on what ground, for instance, could one permit single-family homes on lots of 5,000 sq. ft. but prohibit a two-unit structure on 10,000 square feet? Occupancy limits, covered thoroughly by Alan Durning in a series at the Sightline website, are a means of closing a final loophole and preventing detached, single-unit homes from being adapted to multi-household use as dormitory-style SRO housing with shared kitchen or bathroom spaces. As should be clear from the above, the single-family zone, far from the straightforward concept that it it pretends to be, is a complex and artificial legal construct with many interlocking parts designed to forbid any deviation, no matter how slight, from the ideal. Nor is some universal concept which is simply given recognition in law: in many or most countries, the idea of regulating housing in such a manner is not even conceived of. In Japanese zoning law, for instance, only bulk and height are regulated, and no attempt is made to restrict how the space within the building envelope is divided into living quarters. division to imply differences in outward form. At the time of Bassett's writing, courts had already upheld lot coverage maximums and height limits, which together could be deployed to greatly restrict net buildable square footage on any given lot. The question remained whether within this building envelope a city could restrict the number of units (kitchens, essentially). Bassett, a lawyer who always seemed to worry more as to whether courts would uphold his ideas than whether the ideas themselves were sound, was concerned that this would go beyond the legislative purposes for which zoning had been authorized by the states. "With particular reference to apartment houses, it is pointed out that the development of detached house sections is greatly retarded by the coming of apartment houses . . . . Moreover, the coming of one apartment house is followed by others, interfering by their height and bulk with the free circulation of air and monopolizing the rays of the sun which otherwise would fall upon the smaller homes, and bringing, as their necessary accompaniments, the disturbing noises incident to increased traffic and business, and the occupation, by means of moving and parked automobiles, of larger portions of the streets . . . ." (Emphasis added). All the court is doing here is recapitulating its decision in Welch v. Swasey in which it upheld restrictions on height and bulk (essentially, the establishment of a three-dimensional building envelope). It does not squarely address whether a city could restrict the number of units in buildings constructed within existing height and bulk limits. * It does not address whether a city could ban multi-unit buildings even where they are no denser, in units/acre, than single-unit structures. It does not address whether parking concerns are valid in an area where on-street parking is prohibited or where parking and traffic is managed by some other means than the one imagined by the court. In other words, Bassett's primary concern regarding the constitutionality of single-unit structures, as a separate use, goes entirely unaddressed. Without a concrete controversy before it, the court had no need to utter the notorious words in the passage above, which as noted above were largely irrelevant to the actual issues in controversy surrounding multi-unit buildings. It would have sufficed to note, as the court actually did later in the opinion, that zoning ordinances must be assessed in detail rather than in generality. The court realizes this toward the very end of the opinion: "In the realm of constitutional law especially, this Court has perceived the embarrassment which is likely to result from an attempt to formulate rules or decide questions beyond the necessities of the immediate issue." This humble admission appears in the same opinion in which the highest court in the land slanders apartment buildings as "mere parasites." The court did issue one opinion two years later striking down a zoning law in detail, in the slightly less well-known Nectow v. Cambridge case, but afterwards fell largely silent on zoning. 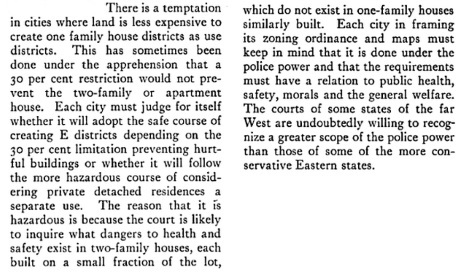 Bassett's question was not and has not ever been addressed by the Supreme Court, a fact which has been appreciated by a few authors going back at least as far as attorney Richard Babcock's 1983 article The Egregious Invalidity of the Exclusive Single-Family Zone. "The Oxford Construction Company [applied] for a permit granting permission to erect four brick apartment houses upon a plot of ground located at the corner of Highland and Lincoln avenues, in that city. The application was refused upon the sole ground that the zoning ordinance of the municipality prohibited the erection of such buildings in that locality, no suggestion being made that their presence there would constitute a menace to the health, safety or welfare of the public. Thereupon, the construction company moved before the Supreme Court for the allowance of a writ of mandamus to compel the inspector to issue the permit applied for. Upon the final hearing of the cause, it appearing to the court that the presence of the proposed apartment houses in that locality would not endanger the public welfare, health or safety, a peremptory writ was directed." The city appealed the decision claiming that this reasoning was invalidated by Euclid, but the New Jersey Court of Errors and Appears disagreed and upheld the lower court's result. In response to this decision, Fischel explains that the New Jersey constitution itself was amended to permit single-family residential as a zoning category. The text of that initial amendment, which seems to no longer appear in the constitution, is difficult to locate, but in any event the question at issue was not and has never been passed upon by the US Supreme Court. With New Jersey's pro-property rights judiciary having been outflanked by the people themselves, single-family zoning seemed triumphant. Ninety years after the Euclid decision, land use debates in the United States continue to be distorted by this same dichotomy between "single-family zoning" and "multifamily" areas. Rather than talking about housing in terms of units/acre, or total floor area, or some other similar metric, we tend to use purported building types -- whether single-family, duplex, triplex, ADU or other such classification. Yet these classifications are in a sense illusory. Whether a builder puts up three detached homes on a lot, three stacked units in a triplex, or three side-by-side units in rowhouse form really shouldn't matter a great deal to the regulator. The court's confusion on this point may have stemmed in part from the lack of a concrete controversy. The respondent, Ambler Realty, was seeking to use its property for industrial purposes, and had no intention of constructing any residential buildings, much less apartments. The dispute was an abstract one which only pertained to the value of the land. Had the court been confronted with a scenario in which an individual builder sought to construct a two-unit building conforming to height and bulk regulations within a single-family zone, it could not have evaded the question so easily. Writing in 1983, Babcock assessed the situation as follows: "Today, there can be no justification under the police power for compelling the construction of single-family houses. The daring trial lawyer who chooses to litigate this issue will undoubtedly lose in the trial and intermediate courts. But he should prepare his record with the Supreme Court in view. Using as witnesses builders, demographers, engineers, planners, environmentalists, and land economists, he should build a record that once and for all demolishes the notion that the single-family detached house is to be forever isolated and protected." Has this question been posed to any American court in the recent past? Perhaps not as directly as this, but there have been small victories here and there against unreasonable minimum lot sizes and minimum home sizes in the courts of various states. Victories have also been won, on occasion, under a fair housing rationale. A combination of the reasoning from these victories, in the proper context, might yet succeed in the courts of one state or other. *As Alex Cecchini astutely notes in a recent post at Streets.mn, if we assume that the preservation of natural light is a valid purpose under the police power, it is not clear why these concerns are better addressed in a scheme where single-unit structures and multi-unit structures are segregated then where, by contrast, multi-unit buildings are scattered among single-unit structures. In the former scenario, the multi-unit structures receive abundant light while shadowing only a small number of houses, whereas in the latter the multi-unit buildings all cast each other in shadow, resulting in a net loss in well-lit units. > the single-family zone, as defined below, is a century-old American invention, and is rarely found in the land use codes and regulations in other countries. New Zealand, along with other English-speaking New World countries, probably gets the closest to the American "single-family" idea, but even then, one pillar is missing - occupancy limits, which are unheard of here. It seems odd to our ears that you describe houses as "single-family" and "multi-family" rather than "single-unit" and "multi-unit": the idea of regulating *who* may occupy a house seems strange. It's curious to me that American courts have upheld regulations that restrict the number of unrelated people who may be in a house - surely any external effects are the same, regardless of whether the people are related? And it has a much bigger effect on a protected Constitutional right, freedom of association, than any of the other pillars of the zone. But of general interest, that one pillar being missing is largely how New Zealand addresses the shortages in houses caused by single-house zoning. You simply have one, large, single house shared between a bunch of unrelated adults, what you would call roommates and we call flatmates: for young city people (say 18-30) without money or a family, this is perhaps the most common living situation. This is less common in the US, except for college students, right? IMO This is a massive problem with urban planning in NZ right now, especially in Auckland (which has *SEVERELY* restrictive geography). People are so obsessed with the idea of the quarter acre lot it's becoming increasingly common to see not only college students, but multiple families, etc forced into one living space by the cost of homes. I dated one guy who lived in a house with a mother and her (18+) daughter. I had a friend who lived with his family, plus another room mate. There's nothing wrong with multiple occupancy, per se, but a lot of people have been forced into it by the lack of affordable housing in Auckland (which is a result of anti-intensification efforts). I think Canada is the same, there are restrictions on density, lot size, use, and number of units per lot, but occupancy rules tend to be more controversial. You still have some though, for example the suburb where I grew up requires 150 sf per person in "habitable rooms" (i.e. excluding hallways, foyers, laundry rooms, bathrooms, garages). Many US cities ban more than a certain number of unrelated adults living together. It recently caused an uproar in Boulder, Colorado when the city decided to enforce the rules on "co-ops". Similarly, Grand Rapids residents are up in arms over conversion of a historic mansion to an adult co-op building. And in Connecticut, an intentional community of 11 was being evicted from their Hartford mansion until the action was stayed by the residents suing the city back in Federal court. http://www.courant.com/community/hartford/hc-hartford-scarborough-reopen-case-1028-20151027-story.html Meanwhile, in the Midwest, some cities have "occupancy permits" that require all names of individuals living there to be registered with the government, Soviet-style. Ferguson, Missouri was famous for this kind of stuff. Overall, I can see the definition of "family" being weakened over time with AirBNB and different cultural arrangements. "In other words, Bassett's primary concern regarding the constitutionality of single-unit structures, as a separate use, goes entirely unaddressed. " The single-family occupancy restriction constitutes an invasion of privacy -- it's none of the government's business who I have in my house -- and as such is clearly unconstitutional at the federal level. I presume that whenever push comes to shove, the cities refuse to enforce the occupancy limits -- I know there's huge numbers of so-called "illegal sublets" in almost every city in the nation, and the city *never* interferes with them. It seems silly why anyone would object to: "Would you want 8 houses next to your home?" Here are 12 modern homes on one lot (built post 2011), mixed in with suburban single family homes: https://www.google.com/maps/@-34.8691294,138.585292,96m/data=!3m1!1e3 Still a peaceful street. Great article indeed. Quick correction: William Fischel not Robert Fischel. Thank you! Obviously confused with Robert Fishman, the author of Bourgeois Utopias. Corrected now. Excellent post! I would also commend Stefanos Polyzoides "Courtyard Housing" for the architectural perspective on housing types in Los Angeles, and Dan Parolek's "Missing Middle" initiative for current work. "Single family" production homebuilding is now at a 50% rate of pre-crash levels. Even the "single family residential" isn't really restrictive enough for many people's liking, as evidenced by all the hubbub around "mansionization" in LA. I feel like it's ultimately about notions of middle class respectability, and middle class neurosis as well. What a fascinating post. It's crazy how unaware the majority of us are about this basic issue. I would love to see a compilation of the "wins". What level of courts are they at? How high up do these laws go? What is the underlying reason for the decisions that have been made? Is someone making a profit from this? Thanks Daniel. I do not know if anyone has compiled a list of the wins, although there are more than a handful. As deferential as the courts generally are on this subject, once in a while a law is so plainly irrational or has such obvious improper purpose that the courts will intervene. Off the top of my head, I am aware of a Connecticut Supreme Court case from the late 80s that struck down a minimum square footage requirement for homes in a CT town, and also some other cases dealing with minimum lot sizes. It would be a major research project to catalog all of them. Praxis Studio has been involved in the work of 3D rendering since the time it was just a basic concept.If we've created a 3D architectural model, the cost for additional images of the same model is significantly less.